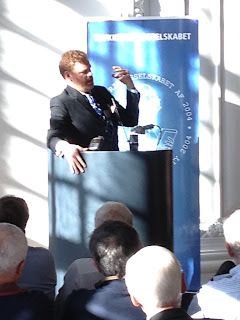 For the tenth anniversary of Flemming Rose's publication of the Danish Mohammed cartoons in Jyllands Posten, Mark Steyn made an appearance in Copenhagen along with fellow freespeechers Douglas Murray, Henryk Broder, and Vebjørn Selbekk. 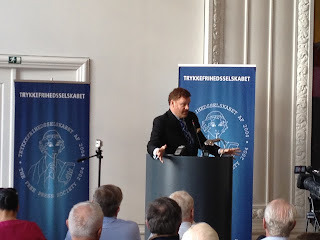 Invited at the behest of The Free Speech Society (Trykkefrihedsselskabet), they were listened to and applauded in a filled hall of the Danish Parliament. Or you kill free speech. If it's not the crusades, it's the cartoons. the United Nations in which the Apologizer-in-Chief said that "The future must not belong to those who slander the prophet of Islam." • In reference to the Hans Christian Andersen story, The Emperor's New Clothes, as well as to Steyn's recent article, The Emperor's Moral Narcissism, the Canadian pointed out that Denmark's most famous author had it wrong: in reality — at least in the 21st century — the little boy's remark that the emperor was naked would not cause gales of laughter along with sympathy for he who saw and for he who told the truth. Today, instead, the boy would be beaten to a pulp. Steyn marks the tenth anniversary of an important milestone in the struggle between a fainthearted west and a resurgent Islam: the publication of the Danish Mohammed cartoons. 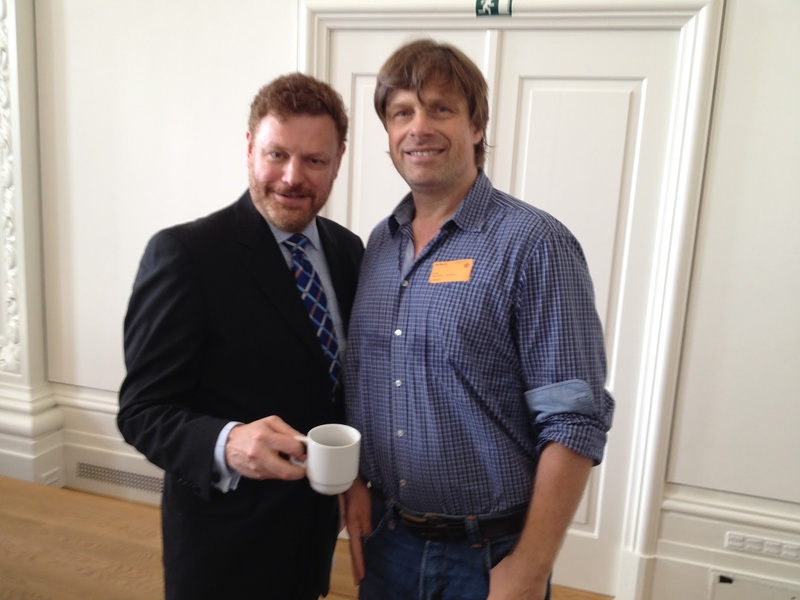 Mark will be appearing in Copenhagen along with Flemming Rose, the editor who commissioned the original Motoons, as well as fellow freespeechers Douglas Murray and Henryk Broder. Tickets are 100 krone - or, for members of the Free Press Society, 75 krone. One hundred krone sounds a lot, particularly if you say it like Doctor Evil, but it's about 15 bucks US or ten quid in sterling. You can email for tickets or more details about the event here. There's no need to write to them in Danish: the Danes speak better English than most English-speaking countries. If you're in the general area - Scandinavia, Europe, the Northern Hemisphere - we hope to see you there. "Fight the hate speech fairies, and fight their islamic Enforcers!" John Boehner, is to resign October 30. An Aleister post on Progressives Today shows all that's wrong with progressives as well as all that's wrong with the mainstream media (thanks to Ed Driscoll). If she isn’t the poster child for netherworld leftist drivel I don’t know who is. The “Dem/lib/prog/commie/satanist [sorry for the redundancy]®” mindset, in one short statement. True enough, and of course what is most egregious are the historical falsehoods throughout her statement. Sara Jane Moore makes it sound like Gerald Ford was a crook because Richard Nixon was a crook (whether either was, or both were, will not be debated here today) and suggests that assassination was the only option available because otherwise both were immune to punishment. But the facts — the incontrovertible facts and the uncontroversial facts — say otherwise. Ford was not appointed. SJM's suggestion is that Nixon illegally took over a democratic process, and among the candidates he — illegally, unconstitutionally — considered to succeed him in the White House (crooks, all of them, in all probability) he finally singled out one Gerald Ford. Of course, that's nonsense. Gerald Ford was not appointed, by Nixon or by anyone else, he became president when Nixon resigned. As (duly elected) vice-president, moreover, he was the only person who could (in an entirely legal fashion) succeed the duly elected and the prematurely departed president. As for the suggestion that either or both of these crooks were immune to punishment, doesn't Ford's accession to the Oval Office lie on the fact that Nixon was forced to give up his presidency and leave the White House? So, yes, we elect our presidents, we don't appoint them, but Gerald Ford was not appointed, the duly elected vice-president duly succeeded the duly elected president when the latter was forced to resign. What is most jarring, perhaps, is how none of these simple historical corrections are ever brought up, however briefly, by the MSM anchor. By contrast, in the wake of the Center for Medical Progress's exposition of the shenanigans of Planned Parenthood, the organization's spokesmen as well as the Republicans backing their cause have been berated by the mainstream media journalists (or should that be "journalists", with quotation marks? ), most recently George Stephanopoulos. Might not Alisyn Camerotahave, indeed, have been the MSM anchor who repeatedly interrupted David Daleiden? Do you remember all the outrage the MSM types voiced after Rudy Giuliani suggested Barack Obama did not love his country? In any case, this helps explain why the mainstream media is always standing accused of using double standards. It sure is hard being a Muslim, isn’t it? You can’t even bring a briefcase with protruding wires to school without everybody thinking you’re a terrorist. Sheesh. As Glenn Reynolds is fond of saying, it's Potemkin villages all the way down. Benny Huang goes on to ironically heap praise on the kind at the center of the controversy. Fourteen year-old Ahmed Mohamed has learned well how to play the victim. The MacArthur High School student caused a ruckus last week in Irving, Texas, when he brought a briefcase to school containing clock parts. He claimed it was a “clock” that he “invented” over the weekend—though it now appears evident that he didn’t really invent anything. According to Ahmed, he brought it to school to impress his engineering teacher. When the briefcase began beeping during English class, the teacher mistook it for a bomb and called the principal. … Ahmed has since been invited to bring his briefcase to the White House to meet President Obama. Oddly enough, the Secret Service would never in a million years allow a similar device anywhere near the President of the United States if it weren’t pre-cleared; and for good reason. … on MSNBC’s “All In with Chris Hayes,” [when] Hayes asked Ahmed how it felt to go through this whole ordeal Ahmed replied, “I feel really well after, cause before I didn’t think I was going to get any support because I’m a Muslim boy.” I’m sounding the BS alarm. He captured the world’s sympathy because he’s a Muslim boy. I don’t believe for a moment that he could not have foreseen this outpouring of support (and money). See how he’s framed the issue? This is something that “happened” to him because of “who [he is. ]” The implication is clear: this whole situation would have played out differently if he had been a fair-skinned Christian lad. Baloney. Any kid of any race or religion who brought the same item to school would have caused the same stir. The only difference I can see is that a white Christian would not have had the Islamophobia card to play. Consequently, he would not have had the support of a dedicated “civil rights” organization, would not have been invited to the White House, would not have been financially rewarded with multiple crowdsourcing campaigns, and would not have appeared on MSNBC. Ahmed was arrested not because of his race or religion but because his “clock” looked like a bomb. It’s a briefcase with a bunch of wires and a circuit board. Nor are clocks and bombs mutually exclusive. Time bombs contain clocks. After showing his “clock” to two teachers, both of them told him that it looked a lot like a bomb. His engineering teacher, the one he was supposedly trying to impress, even advised him not to take it to other classes. There are some clues that Ahmed baited school officials by knowingly bringing a suspicious device to school. It might have been another self-victimization hoax, an attempt to “prove” other people’s prejudices. Self-victimization hoaxes are all too common because society never fails to reward them. I won’t say for certain that that’s what happened. It’s possible that he really did build a clock to impress his engineering teacher, stumbled into this mess quite by accident, then decided to capitalize on his victimhood. In any case, he is trying to capitalize on his victimhood—and not just financially, though he’s doing that too. … I will say this: the teachers, the principal, and the police did nothing wrong except failing to call his parents immediately. They should have done that. The crybabies at CAIR can go stick it. This is not an Islamophobic conspiracy. … The situation smells as fishy as last week’s sushi. But I can say with certainty that young Mr. Mohamed, the “inventor” whose “invention” was actually mass-produced by Radio Shack decades before he was born, is milking this for all it’s worth. What he wants is not equal treatment but for Muslims to be handled with kiddy gloves. His goal, and that of CAIR, is to perpetuate the Muslim-as-victim myth so that reasonable people will second-guess their own motives when they see Muslims acting suspiciously. Don’t be fooled by this professional victim. knowing full well they will then turn around and blame the US shortly thereafter.